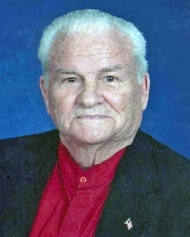 Claude James Adkins obituary. Carnes Funeral Home. Claude James Adkins died peacefully at home on August 18, 2015, surrounded by his loving family. CJ was born on July 29, 1918, and had just recently celebrated his 97th birthday! CJ grew up in Hamlin, Texas, where his family owned the local grocery store. He graduated from Hamlin High School in 1936 and attended all of his class reunions well into his 80’s. CJ worked three jobs so that he could attend Baylor University in Waco, Texas. He was a proud Baylor Bear graduate of the class of 1940 and remained a loyal supporter of his Baylor Bears throughout his life. He later earned his MBA from the University of Houston. CJ enlisted in The United States Air Force following the attack on Pearl Harbor and was stationed in Florida where he met the love of his life, Marion Wood. They married and moved to Houston, finally settling in Bellaire where they started a family and raised their two children. They have been members of Bellaire United Methodist Church for over 60 years. CJ was active in the church and made many of his lifelong friends in the Gibson Sunday School class. An avid bridge player, gardener, Hummel collector and lover of all things colorful and pretty, CJ never met a stranger! He was an active member of The National Association of Accountants, having served as President of the Houston chapter and a national director. He was on the Board of Directors for Citizen National Bank, The Bellaire Men’s Club, and The Houston Hummel Club. CJ worked for TRW Mission Manufacturing for over 30 years as an accountant and Director of Transportation. He also worked at various times for the Internal Revenue Service, Powell’s Greenhouse, Edward D. Jones, the Houston Colts 45’s and the Houston Astros organizations, and the University of Houston as an assistant professor. Known affectionately by many names, Claude, CJ, Curly, Poppie, Uncle Jay and Dad, he was a devoted husband and loved his family and his many friends. He is survived by his loving wife of 68 years, Marion Wood Adkins; son, Barry Wood Adkins and wife Kim O’Connell Adkins; and daughter, Jill Adkins Brlansky and husband John Randall Brlansky. He is also survived by his most precious and loved granddaughters, Lindsay Adkins Minor and husband David Bradley Minor, Courtney Jaye Adkins, Emily Claire Brlansky, and Amy Evelyn Brlansky; great-granddaughter, Caroline Claire Minor; sister, Hazel (Addie) Adkins and numerous nieces and nephews. A celebration of life will be held at Bellaire United Methodist Church on August 26, 2015, at 2:00 p.m. The family would like to thank Houston Hospice and CJ’s special caregivers, Brenda, Casi, Esmeralda, Maria, Monica, and Trinidad for their loving care and devotion to CJ and Marion. Along with the usual remembrances, please consider a donation to the charity of your choice in honor of CJ Adkins.